In the mid-2000s, Prince had returned to the mainstream spotlight in a way he hadn’t since the 1980s. His battle with his longtime label, Warner Bros., was over. He had reclaimed his birth name, been inducted into the Rock and Roll Hall of Fame, and was living out in Los Angeles, throwing star-studded purple parties at his famous 3121 house. By early 2007, he engraved his legacy into bedrock of history by delivering the greatest Super Bowl halftime show ever, and as that fall approached he was preparing to play a record-breaking run of 21 consecutive shows at the O2 arena in London. So when July 7, 2007, rolled around — 7/7/07 — people figured that the artist who had a lifelong fascination with the number seven would do something special to mark the occasion. But what no one could have guessed was that Prince would celebrate his day, which was officially declared Prince Rogers Nelson Day by the governor of Minnesota, by throwing three separate shows in the span of a two-block radius in his hometown of Minneapolis. It’s hard to believe that a decade has already passed since that momentous day, which is still fresh in the minds of many Minnesotans. Harder still to imagine that Prince isn’t here to do something wild for 7/7/17, or future dates he’d surely note, like 3/1/21. As time marches boldly onward, I wanted to take a few moments to remember this gift that Prince gave to Minneapolis. 7/7/07 was the first and only time that Prince would perform at the downtown department store Macy’s (which just closed last winter), and it was the final time he would play Target Center and the venue he made world-famous, First Avenue. What follows is the story of how that incredible (and boiling hot) midsummer day unfolded, as told by some of the people who helped pull it off and witnessed it first-hand — including never-before-seen photos of that last gig at First Ave by Minneapolis photographer Steven Cohen. As the 7/7/07 date approached, Prince announced that he would be launching a new perfume, 3121, and performing at a launch party at Macy’s and at Target Center. Fans lined up at Macy’s in April to purchase VIP ticket packages — $250 for tickets to both shows and a bottle of perfume. No one had any idea that he would also tack on the third First Avenue show, but folks still planned to fly in from all over the world. The day was shaping up to be a big deal for Prince’s hometown. Prince hadn’t played within the Minneapolis city limits since September 6, 1999, when he played at the short-lived Mill City Festival (his shows in the early 2000s were at the Xcel Energy Center in St. Paul), and he hadn’t played at Target Center since 1997. Almost every person who attended the 7/7/07 events has the same recollection of their experience: a long, hot summer day spent waiting in line. Prince would go on late at Macy’s, which pushed back the time of the Target Center show, which made it even trickier for him to pull off the master plan he revealed only days beforehand: That he would cap off the day by performing at First Avenue for the first time in 20 years. First Avenue’s talent buyer Sonia Grover and general manager Nate Kranz had been wanting to book a Prince show for years. They estimate he’d have his people call the club around twice a year and float various ideas. When Prince’s representatives called on July 3, 2007, the First Ave team immediately swung into action. By the next day, most of the details had been confirmed. 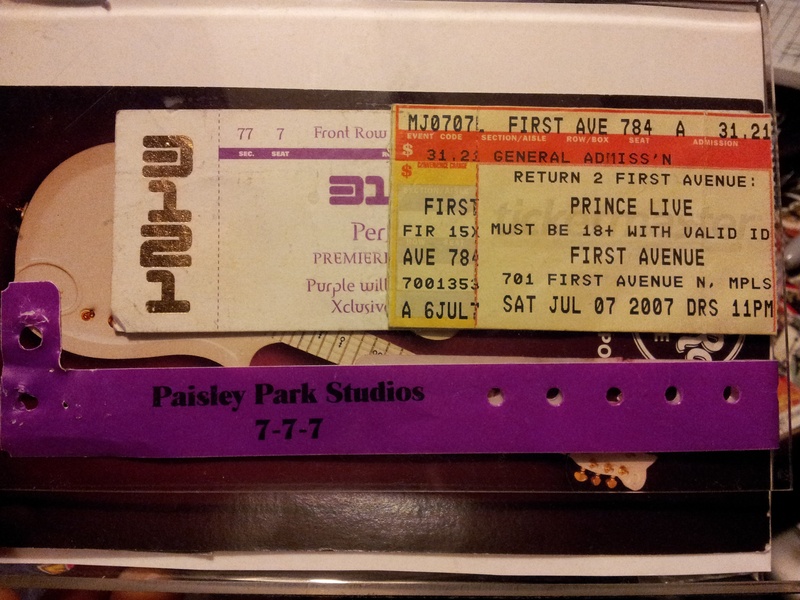 On July 5, 2007, the news was posted to Prince’s 3121 website: “Return 2 First Avenue: PRINCE LIVE. The official aftershow 4 Prince’s Target Center event this Saturday will take place at First Avenue.” By the next night, Friday, July 6, people were already getting in line to buy tickets when they went on sale at 3 p.m. on Saturday. “We didn’t expect the line that we saw around First Avenue on Friday night. At 11 p.m., there were probably 250 to 300 people already in line,” recalls Jeremiah Freed. He had just arrived in town that day and had no choice but to simply get in line and stick it out along with the dozens of concert hopefuls lined up with their camping chairs, sleeping bags, folding tables, and coolers full of snacks. Finally, on Saturday afternoon around 3 p.m., 7/7/07 started to swing into action. First Avenue’s tickets went on sale and the line slowly made its way into the club to get its tickets and wristbands, while those further back in the line panicked about whether or not they would make the cut. After the gig, the street in front of Target Center would soon overflow with fans, forcing police to block off traffic. Although the Target Center show was supposed to start at 8:30 p.m., it wasn’t until 10:05 that Prince would take the stage. But he made sure it was worth the wait: He kicked off the show with one of the biggest hits of his career, “Purple Rain,” with none other than Wendy Melvoin playing lead guitar. “In the crowd — and she shared this on Leno a few months later — was Sandra Bullock. She was at that Target Center show. Her husband flew her out because she was a huge fan,” remembers Jeremiah Freed. Across the street, First Avenue’s staff was eagerly waiting for Prince to leave Target Center and head to the after-show. Originally, Prince hoped to walk across the street along with his fans, like a guitar-wielding pied piper. But his team convinced him to ride in a limo across the street as they raced to wheel gear across 1st Avenue and get ready for another show. Nate Kranz figured Prince would take the stage shortly after midnight and play until bar close, hoping the police would understand if they ran a little past 2 a.m. But by the end of such a marathon day, things were seriously delayed — Prince didn’t appear on stage until somewhere around 2:45 a.m. After all that waiting, the room exploded as the band struck up “3121” one more time. “When the lights went dark, everyone just hushed. ‘3121’ was incredible,” remembers Rich Benson. “3121” was followed by a mix of fan favorites, including “Girls and Boys,” “I Feel for You” (from his second album, Prince) and “Controversy,” which Prince played many times in the early 1980s as his career was just beginning to rise. He was joined by Sheila E. and Wendy Melvoin, who had both performed at Target Center, and Larry Graham was waiting in the wings for his turn on bass. “There was no one else — no other cars, no other people,” Grover adds. Kranz and Peterson tried to convince the cops that they were in the clear — they had stopped serving alcohol by 2 a.m., by law — but the police insisted that they were past curfew and needed to shut down the show. “You started to see the police come in,” remembers Jenny Bonde. But Prince was in the middle of his show — who was going to tell him to stop? “You saw this commotion. Someone whispered to someone who whispered to Prince,” says Benson. Kranz estimates that the police had allowed Prince to play about three more songs before finally pulling the plug. After getting the news, Prince came back on stage to break the news to the audience. “Then he said something like, ‘See you back soon,'” says Grover. “‘I’ll be back soon,'” recalls Kranz. So the city activated a so-called “Prince Permit,” which First Avenue could request with little advanced notice, when needed. In the decade that’s passed since 7/7/07, the “Prince Permit” has only been pulled once: This year, on April 21, 2017, when the club wanted to throw a memorial dance party in Prince’s memory that would go until 4 a.m.
Actually P played Target Center approximately 10 years prior for his Jam of the Year tour following Emancipation release. Current Twins manager Paul Molitor was in attendance just a couple rows in front of us in floor seating. I was positioned by a side door outside First Avenue in hopes of hearing Prince perform that sweaty 7/7/7 night. Just when it sounded like the show was starting i heard a voice behind me say ‘Put this wristband on now & get in there – he’s about to go on’. “Sec 77 Seat 7” ?!?!?!?!? Even COOLER!!! Fantastic story and wonderful memories! Thank you!